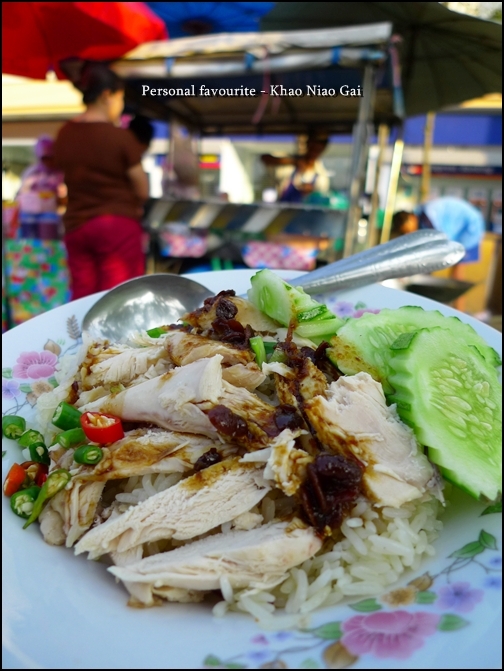 Continuation from Krabi Night Market …. 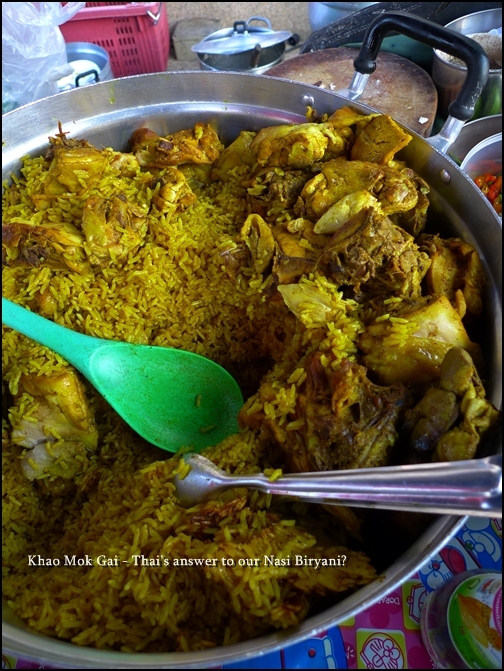 The yellow-hued grains with chicken is called Khao Mok Gai, a type of Thai-Malay dish not unlike our very own Nasi Biryani. 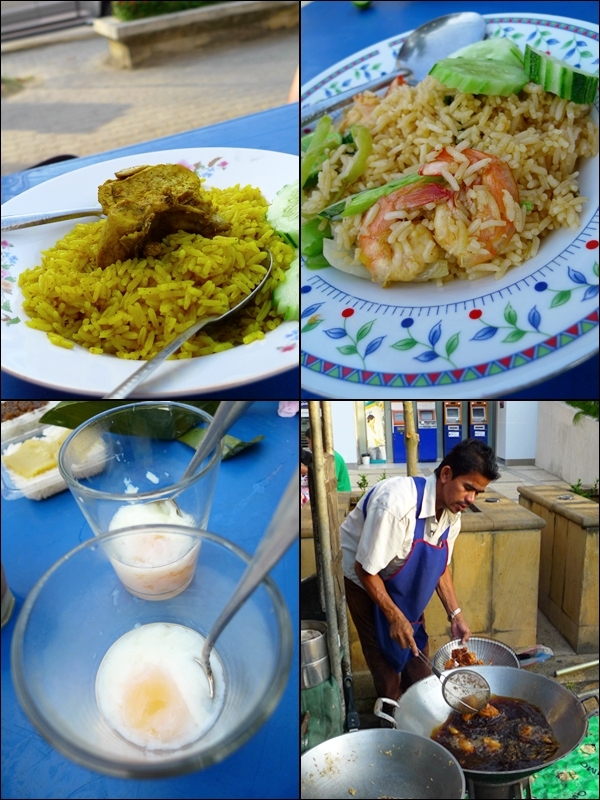 Catch the whiff of the Khao Mok Gai, the fried rice with prawns (Khao Pad), start your day with some soft-boiled eggs, and do not peek at the wok-ful of DARK elixir …..
Another one of his specialty, and one of southern Thailand’s most famous breakfast of choice is the Khanom Jeen, comprising of rice vermicelli noodles served with fish curry sauce (or in some instances, chicken or pork ribs curry) and slices of cucumber, and raw greens on the side. At only 20 baht/RM2/USD0.60 per serving, you bet you can down packets of these in a flash. 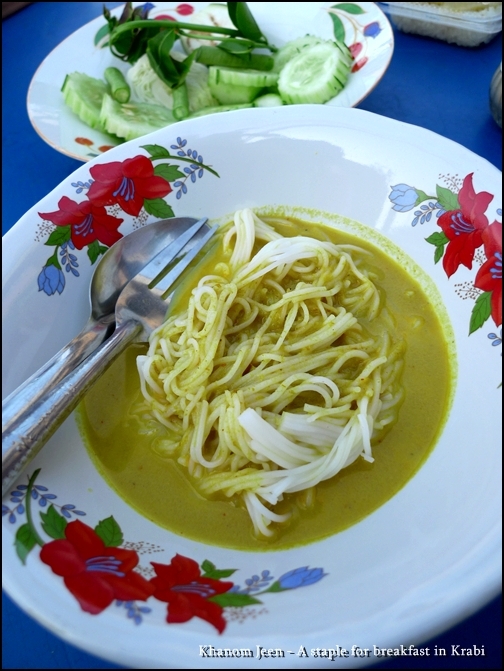 The thin, long strands of noodles resemble spaghetti, and the yellow curry was not spicy at all, but instead very rich, bursting with flavours from the spices and coconut milk. 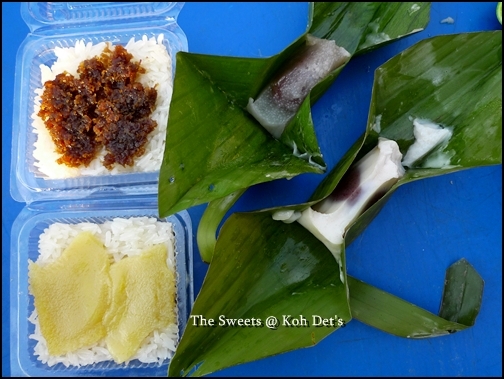 Aside from the assorted range of savouries for breakfast-brunch, Koh Det also serves a variety of sweet snacks (kuih-muih) to cater to the lighter eaters. The sticky rice with ‘kaya’ (coconut & egg jam) was especially memorable, for the almost beige-coloured kaya was richer than our variety here, but tasted smooth and complemented the sweet-ish glutinous rice perfectly. Different from Keng Nam’s version for sure, and not as sweet. The ones wrapped in banana leaves resembled ‘kuih koci’, with a slightly salty taste, and the glutinous rice with shredded sweetened coconut was passable as well. So if you’re ever in Krabi, and staying around Ao Nang, do look out for this stall, and its neighbouring ‘wonders’, serving from burgers to sandwiches, and pancakes to fresh fruit juices. Location : Main road of Ao Nang, Krabi. About 5-10 minutes walk from the beach. In front of Bangkok Bank, which is on the same row with 7-11 and McDonald’s. Aiks, I thought you can easily find it in Nyonya Kuih stalls everywhere? 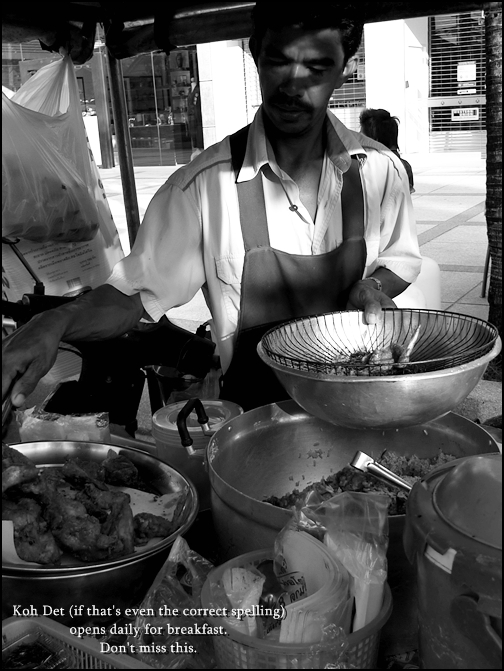 Love all the street food shots! Thanks. This type of stall usually serves the most wondrous creations. Gorgeous!! Breakfast of champions! I think I’d like the sticky rice with chicken very very much! What a funny way to serve the soft-boiled eggs… 🙂 Did you drink it? 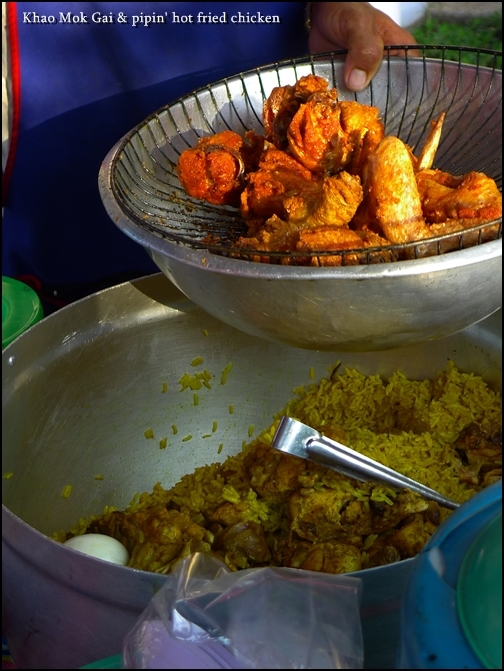 Your blog/pics only confirms my dream to travel and explore some of these wonderful food and street vendors. Though we don’t have anything similar (except for hot dog vendors in the summer), in the Caribbean there’s tons of local dishes served in a similar fashion. Please keep posting more pics. do you still remember what time does Koh Det’s open for business? its a year now since u went, i wonder if i have a chance to taste Koh Dets breakfast but i need to take note of the opening hours since the tour van will be picking us up at 8am. your advice will help alot! Hello seetee…. I remembered we went quite early for breakfast. Before our van picked us up. Anyway, if all else fails, directly behind this stall you can find 7-11. Hehe … and you know lah, Thailand’s 7-11 sells good hot dogs, burgers, breads and such. Hi Jo … yup, a variety of bottled milk for your choosing! Nice post, I will go there this May, must definitely try it. but if you still rmb, how is the pricing of the food? Expensive or just like our mamak stall (within RM10)? Krabi is the beautiful place for my dream honeymoon.